In the morning, the starter passed the water glass test so I mixed it all in my glass mixing bowl. I noticed after a couple of hours, the dough was already very wet. This seems to be an issue with all my no-knead bakes: too much hydration. The first rise was about 13 hours and it was probably too long since it was a warm day in my apartment. I could could not form it into a tight ball and it too sticky and stuck to my hands as I shaped it. I did the second rise in the dutch oven. It went splat like a pancake which is another indicator that the dough had too much hydration. I only read after that I could have shaped it in a cloth covered bowl or the pyrex mixing bowl again. The baking took less than 60 mins. It was actually overbaked when I took it out and I would probably bake it for about 20 mins covered and 30 mins covered next time. I also would not do the oven door trick for more than five mins. The smell was incredible. I noticed how my neighbour’s bread would waft into the hallways and mine enveloped my whole apartment. Results: The bread stuck to the bottom of the dutch oven which means it was too wet and there was not enough cornmeal. 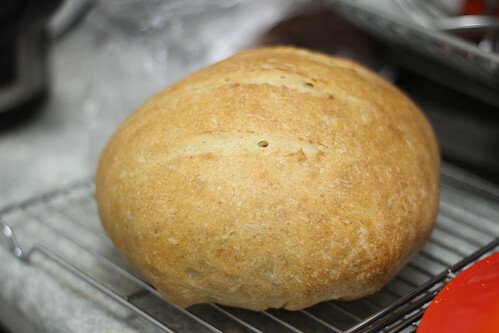 The crust was too hard and the crumb was very irregular. It had giant holes, all a sign of too much water. The taste was sour and it was robust tasting because of my rye/wheat starter. It was still way overdone though and the crust was too hard. Started in the morning after water glass test, but I was so eager to do the test again, I was running really low on starter. After seven or eight hours, I did the suggested folds every 30 mins for two hours. Even though this is recommended at the beginning of bulk fermentation, I think this helped as I noticed volume after I did the folds. For the second rise after ten hours, I shaped the dough into a tight ball and put a cloth in the glass mixing bowl and let it rise from 30 mins to 1 hour. This was probably unnecessary since the dough was not as sticky and held its shape well. I baked 20 mins covered and 35 mins uncovered. I did not open the oven door, but I took the bread out after 25 and 30 mins uncovered to check the temperature. Results: (see first photo for the result) This was the best looking boule and best sourdough I have made yet. I was really happy with the result and I learned a lot. The crumb is tighter, but the bread was taller and had more volume. The crust was crisp, but not as hard as my other crusts has been. I love it so much. In bad news, I got burned when I touched the lid I took out from the oven resulting in my worse kitchen injury yet. My left ring finger blistered and it was very painful, but the taste of the bread the next morning really made up for it! 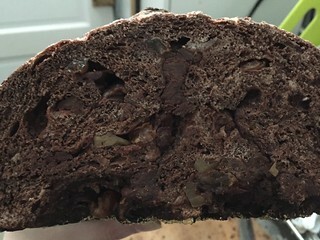 Adapted recipe is Sourdough Noir from The Clever Carrot. Before bed, I did one stretch and fold. I put the dough to rest in my bedroom because it was one of the warmest rooms in the flat. Eight hours later, it was ready for the second rise, but there were too many add-ons even though I took out 20g from the nuts and the raisins. 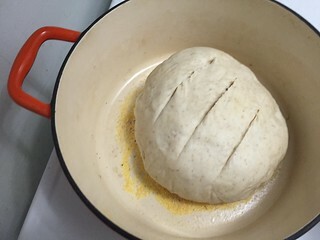 Second rise was about 30-35 mins in total. Then 20 mins covered. After 33 mins uncovered, I checked the temp and found it was done since the deep bottom of the boule was hitting 207F slowly. Ingredients: I used Kirkland brand chocolate chips for the first time and they tasted really good. Used Cocoa Camino Dutch Process. I am running out so may need to hit Costco for the Rhodelle one for the next attempt. Results: Wow. I think the water level was right. 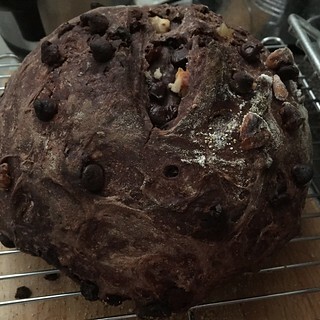 The mix of chocolate chips, walnuts, and raisins were perfect giving it this sour, sweet, nutty, and rich taste. I ate most of it untoasted, but toasted, it melts the chocolate making it sweet. I personally do not need the extra sweetness, but I did serve it to others with powdered sugar. It was wonderful for Easter weekend. It’s a perfect bread alternative to a cake because it’s vegan and has no additional fats unless you want to add on to butter. Love it. Next time: Make sure I do not mess the first step. Auotlyse the full hour. Cut down the nuts and dried fruit down to about 25g each. Maybe cut down some of the chocolate chips to 100-125g. I would love to make this in two loaves, but I only have one dutch oven and my oven is a substandard size. Try cranberries instead of raisins in the future as well.